“We all like an excuse to be bad”: the tagline of this new production by Jodi Gray at the ever impressive Vault Festival in Waterloo. 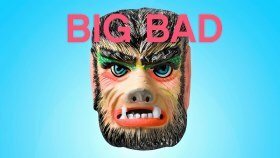 Big Bad explores the pressing issues surrounding gender, sexuality, femininity and empowerment. This one-woman show places its audience inside our storyteller’s cage, as she attempts to explain both the situation she has found herself in and try to understand it at the same time. A gruesome, bloody, beautiful depiction of the animal within us all soon unlocks our intrigue into what exactly this woman is or might be. In time we learn to perceive as much about Susi’s story as we do about Susi herself. In her prison (befitting of the Vault’s underground, cave-like venues), Susi retraces her steps for her apparent captor who will not interact with her – other than the odd painful electrocution. We soon learn that Gray does not want us to sympathise with Susi and in fact, the audience are encouraged to view her as the chained beast her captors have created. With only one actress (Arabella Gibbins) guiding us through this journey, the audience soon grow to trust Gray’s character – an often missing feature to one-person performances. We are no better than Susi’s captors who watch as she unravels into an undefined beast that hungers for flesh.The one match for this extraordinary piece of writing is Gibbons’ performance. The audience were sincerely captivated from start to finish and at no point did the energy, focus or power of the piece flounder. A true credit to Gibbins who visibility had put her blood, sweat and tears into this performance. The character she had created in Susi was immediately engaging and somehow she had managed to pursued her audience to side with her – despite explicitly explaining and recreating disgusting and unimaginable acts of violence. With such a brutal and intense subject matter, Big Bad had a real challenge in making this accessible for an audience in order for them to both understand the character and try to see something of themselves in her. Gibbins did this with such success that it came across as ease. To deflect the possible trouble of falling too deep into Susi’s psyche, Gibbins used humour to pull us out of darkness. Though these moments were scarce and used more effectively in the first half, it creatively bridged the gap between fantasy and everyday life. Susi was precisely self-aware enough to use comedy which was intended for her captor, but actually nodded more so to her attentive audience. The writing is so effective in this sense that the audience found that they were associating themselves with what can only be described, as a monster. This is, however, where there was a slight disparity. Susi – dressed in modern clothes and using colloquialisms we were familiar with – was actually trapped in the 19th century and was a victim of Jack the Ripper. This component of Big Bad needed more development to fit into the rest of the environment. On the whole, the ambiguity did work and certainly raised questions for the audience – an important conclusion for a piece tackling the themes that it did. However, these few areas of imbalance within the narrative negated from an otherwise interesting use of abstract concepts. More clarity on the time, place and location could have benefitted our connection with the plot and allowed us more time to focus on the true motif of female empowerment that Gray had crafted. Nevertheless, it was made abundantly clear by the end that this performance was crying out to unlock and liberate the woman within – as Susi removes the physical shackles that have held her in place since the start, freeing the monster she has now become. They wanted to tame her, keep her, control her. You know when you’re escorted by a policewoman from your place of work in handcuffs? Naked, covered in someone else’s blood. Big Bad is a blackly comic, supernatural tale of imprisonment, resistance, and female sexuality.